Pictures are very important. You can sell things with bad pictures (I sure have) but you’ll sell more and it’ll be easier to sell if you have good pictures. It is worth working on. My pictures aren’t great in terms of works of photography but they are good enough to stand out on Etsy and be featured (see how mine is the lamest out of the ones above). I could invest more time and improve them but since I have to pick and choose how I’m going to spend my time, I go with a sort of bare minimum that still sells and gets my products noticed. So what makes a good enough picture? For me I have a four questions I ask myself when I evaluate what pictures to use for my listings. I hope you’ll find them helpful. Can I picture my image on Etsy’s front page? Take time and look at the front page (it changes a couple times a day). Also look at the treasuries that are considered hot. 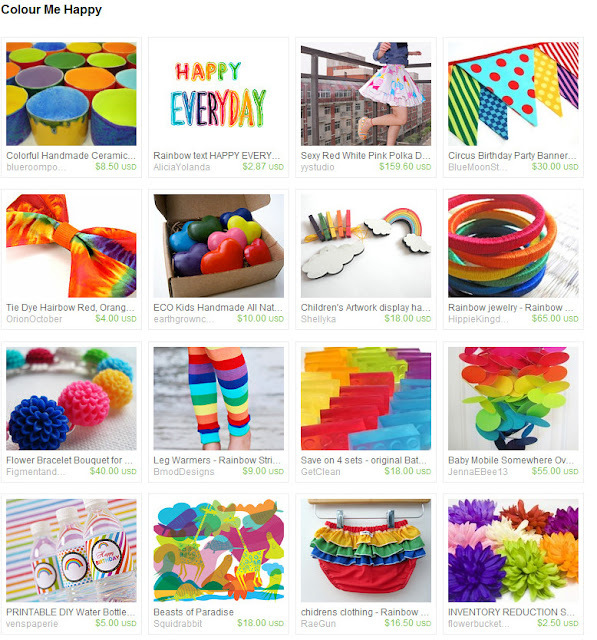 You’ll noticed most treasuries featured on the front page include items with a similar feel to their photos. Clear colors, natural lighting, bright (as opposed to shadowy and dark) photos taken from interesting angles (rarely ever above the product laying on a table). Many featured items are staged with props. Study what Etsy features (because most of what they feature is based on that first picture in the listing) and try to make your photos so they would look good sitting along side those pictures. How will my pictures look like cropped? Except in your listings when the photo is selected your photos will always appear cropped. In treasuries, your featured items on your shop home page and on the front page the pictures are a rectangle with the top and bottom chopped off. In other places it will be cropped into a square. Yup different sizes, kind of annoying but that’s life so make sure when you frame your shots you leave room around so that your product fits inside the frame when it’s cropped. Is my image clickable when it’s a thumbnail? Most people will see a tiny image of your project. You need the image to be tempting enough to make them click it. This is both for potential buyers, Etsy admin that choose items to feature, and treasury makers who will feature your items and may get their treasury (and so your item) featured on the front page. Compare your images to the others that show up around it. How does it look in that long line in the search full of tiny images. Yes there are a lot of bad photos on Etsy try to make yours stand out. Is my product properly represented? Remember that the pictures and description are all an online shopper has to go by. I think you should give all the product details twice. Once in words in the listing and a second time via pictures. Are the colors visible, do you show the different angles and views, does it give you an idea of the scale or size, does it show details that make it special, does it show how it works, possible uses, possible functions, etc. Sure you might want a more eye catching artistic photo for the first image but you’ve got 5 pictures available for each listing, try to answer your potential customers questions by showing different shots. I have ALWAYS used a point and shoot for my Etsy pictures. I also always edit EVERY picture before I put it on Etsy. I use Picassa a free program and really like it. They have an “I feeling lucky” button, “Auto Color” and “Auto Contrast”. I use the “I’m feeling lucky almost always sometimes I use the other two if the whites look too yellow and sometimes when I’m stuck taking pictures at night (try to avoid this at all costs) I tweak the lighting. For me clicking the one edit button and saving is usually all it takes and it makes a huge difference. Use natural light when possible. Open all windows possible. If you’ve got a place where you can shoot outside away from direct light that might be good too. I’ve always taken pictures inside next to or across from a window. I only take them at night if for some reason I forgot to take one during the day and it’s a new item that needs to be in the mail before I can wait until better light. You might not know much about photography but if you are going to do well selling online it’s necessary to learn some basics. Play around with taking pictures in different places you have available with different lighting and staging options. Also try out the free photo editing programs (there are many out there). If you take one tip away from this I hope it’s to look at the pictures that Etsy features and to try to get yours to the point that they’d look at home on the front page. So many times I wonder how many cool products I just skimmed over in my browsing because the picture was unclear, or weirdly staged, or somehow otherwise not grabbing me. When I write articles for Modern Handmade Child I have a hard time finding cute items with decent pictures that fit my articles themes. If you just touch up your pictures a bit it will go a long way in helping you stand out in the crowd, get featured and hopefully help you sell your creations. I hope that helps, I am not a photographer at all I just know the bare minimum to make my pictures work for me. I look at my pictures and can name things wrong with each and every one but they are good enough for my purposes. Your pictures need to be decent not win any awards. I know many of you have wonderful insight so as always please please share in the comments so we can all learn from each other. Not an ESTY shop owner, but I am a buyer and I’ve noticed a disturbing trend lately. People using mannequin heads *shudder*. It’s ugly and distracting and makes me not want to buy your stuff when I see it. Use real people to model products. I agree pictures can make the sell. I am looking forward to having more time in the future to upgrade my photos. Good tips for selling on etsy. These are helpful as I work on setting up an etsy shop. I’m your newest follower on GFC (which isn’t going away any time soon). Thank you! Very useful for blog pix too. I always wish mine looked more professional! I’m not sure I’ll be starting an Etsy shop any time soon-I just don’t have the time or patience. But this is a great tutorial!! Thanks so much for sharing this at this week’s Tutorial Tuesday! I have been a Picasa fan for years so it’s nice to feel validated. I also have Etsy goals so it’s nice to feel motivated. This is such a GREAT post!!! You bring up GREAT points!!! Great post, I know my sales suffer, b/c my pics are so awful. I just need to close up shop for awhile and take some decent pics. Glad you linked to “Cowgirl Up!”, I love your etsy posts :) I totally agree with you about lighting. No flash and natural light are the best. I have actually used my iphone several times for pics, and they turned out pretty good. The secret is a neutral background and the lighting. Thanks for sharing! So true Samantha/ Those iphones are actually pretty decent cameras thanks for adding the natural light and neutral background emphasis! Anyway, these are great things to think about (like the, “how will my image look cropped?” thing; that never would have occurred to me). Great tips. I am fixing to open an Etsy shop so great info. I found you on RadCrafter and I am a new follower. Great thoughts – I love that this is photography from a non-photographer’s perspective…a little help for those of us who don’t have fancy cameras. Thanks for linking up! I’m just getting started on Etsy so I need all the advice I can get. Thank you for the tips. I just started my etsy shop about a month ago and I know my photos need work but I wasn’t sure how to go about it. You gave some excellent tips, and I am going to try them all out. I wanted to let you know I am linking to this post tomorrow at Bacon Time. I recently took new close up shop pics and am sharing my pics and my tips for close up shots. Still not done with all the shop pics but getting there. Anyways thanks for your helpful post.